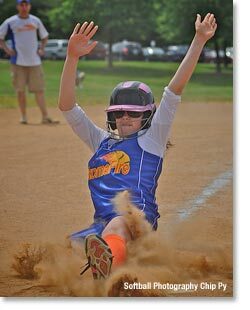 Takoma Fire Softball is a competitive girls fastpitch softball program dedicated to providing girls age 8 and up with an intensive, meaningful, and most of all fun softball experience, by developing and using softball skills. We emphasize high level skills development. We are nominally a Takoma Park/Silver Spring (Maryland) organization but we recruit from all over Montgomery and Prince Georges County, DC, and even Virginia. We participate in regional as well as travel softball tournaments and local leagues, Spring, Summer and Fall. We hold clinics year round including indoor programs in the winter. Our clinics and programs cover pitching, catching, batting, fielding, base running, conditioning, strategy, and sportsmanship. We hire renowned trainers and coaches for these programs. At the younger levels emphasis is on fundamental skill development and fun. At the higher levels there is more emphasis on the finer points of the game. Most girls who continue with our program play high school softball; some go on to play college ball. Takoma Fire was founded in August of 2003, with a single 10u team playing that Fall in the Fairfax County Girls Softball League. The following Spring/Summer, 2004, the Fire fielded 10U, 12U, and 14U teams playing in regional tournaments. Since 2005, nearly every Spring/Summer and Fall season the Fire has fielded teams in all age groups: 10U, 12U, 14U, and 16U, playing in regional leagues as well as regional and travel tournaments. The summer of 2010 saw our first 18U team take the field.